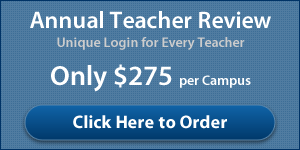 Just purchase seats and send a registration code to your new teachers. They can then immediately begin taking the course at their convenience. They can complete the course in one day or they can complete it in several sessions over multiple days — the choice is up to you and them. The course remembers each participant’s progress and will ask them if they would like to start in the spot where they left off. The course takes between 5 to 9 hours depending on an individual’s pace. The course is filled with interactivity, video, personal stories from other teachers, and engaging learning methods. This is not just watching a video or reading online text! Teachers will even see live responses from other teachers throughout Texas as they go through the course and have the opportunity to post their own responses. 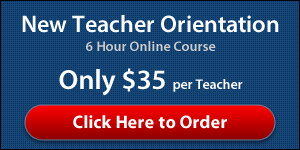 Still have Face-to-Face in an online course? At a recent ESC workshop, presenters talked a great deal about “retooling” our teachers and emphasized that we must expand the capacity of our classroom teachers and principals, and not in the “same old way”. The message was that training needs to be continuously available, consistent, and replicable on a large scale. The stimulus guidelines speak loudly to the need to do things differently. With the online version, teachers will have the opportunity to review the material throughout the year, all year, such as when they are working on their Teacher Self Reports (TSR) and prior to their official appraisal, or as it might relate to a Teacher in Need of Assistance (TINA) plan. It will be consistent, continuously available, and on a large scale. When PDAS was created, the Commissioner’s Rules required that all teachers be provided with an orientation to PDAS no later than the final day of the first three weeks of school and at least three weeks before the first observation. The Rules for orientation continue to apply to new teachers and teachers new to the district so that all teachers will have been through the Orientation. Despite the requirements, however, practice tells us that there is an overwhelming amount of information to digest during those first few weeks of school, and especially for new teachers. Year-long, continuous access to the PDAS orientation is an invaluable resource as districts and campuses invest in providing the knowledge and skills needed for new teachers to succeed. Because of its online nature, PDAS is no longer just training; it’s a resource. It’s not a manual; PDAS is an interactive coach. It’s not a book explaining to teachers how they will be evaluated; it’s an online mentor demonstrating what it means to be an effective classroom teacher. The goal of PDAS is to “improve student performance through the professional development of teachers”. Each district administrator has access to a special administration area where he or she can view the number of seats purchased and used by the district, see the participants’ progress through the course, view PDF and Excel reports summarizing the participants’ progress, schedule reports to be automatically delivered, and more! For example, you could schedule a detailed report to be delivered to every Principal showing every answer that their participants gave in the open-ended style responses throughout the course. This allows them to get to know their new teachers, while the district can ensure their orientation training obligations are met. Never has administering a course district wide, been easier and more automated! Teacher graphic Self Registration Streamlined! Now participants who self register will receive their username and password immediately from the website. An email confirmation will still be sent to you, but you won’t need to wait for it — participants can begin taking the course IMMEDIATELY! You can add, edit, view and delete participants directly from your administration panel. If a users register twice, no problem, you can delete them right from the screen. If they forgot their password, you’ve got a list of every one of them right there. Now you have TWO ways to register users. You can have them SELF REGISTER with a district registration code, or you can register them centrally through the administration area. The “Course Summary Report” gives you a complete picture of your registered participants and their course progress, grouped by school. You can see which modules particpants have completed and if they’ve completed the entire course at a glance: how many seats you’ve purchased and how many you have left are shown at the bottom. Enable Principals to get to know their teachers better! Have a school specific “Course Detail Report” automatically emailed to the principal of the participants. Several pages of open-ended “essay” style responses per teacher will help administration identify areas of need and strengths for each participant. Reports can be downloaded in PDF or Excel format, or delivered via email attachments. Have any New Teachers who need the course? Unused seats you purchase do not expire! Use them whenever a new teacher comes into your district. Your new teachers can be set up and ready to begin their PDAS Orientation as soon as you give them their registration code and the website address! Accessible It is web-based and is available for the entire year. Teachers can refer back to the content as needed. Affordable Just $35 per participant. Community Learning It combines face-to-face training with on-line content and resources. Teachers feel a part of the Texas community of teachers, since peer responses throughout the course are available as they work through each section of the course. Convenient There’s no need to pull teachers from the classroom or herd them into a gymnasium or auditorium. On-line learning eliminates or reduces travel time and expense. Teachers can log in and take the course when it’s convenient for them, regardless of where they live or work, or when they join the staff. The course remembers their progress so they can complete the course over several days as they have time available. Effective The content provides the knowledge and skills for classroom application of instructional strategies. Teachers see and can recognize effective teaching behaviors. Engaging It uses integrated video, hands-on interactive activities, narrated content, high resolution graphics and flash animation. Flexible Online learning can link local policies and materials to state-wide, consistent content, providing all necessary tools and resources in one spot. Sustainable The quality and quantity of the content is consistent over time. Trackable It assesses learning, measures progress, and reports results via on-line reports that are downloadable in a variety of formats.